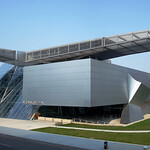 Spanning three centuries, the Akron Art Museum combines a late nineteenth-century brick and limestone building with the twenty-first century John S. and James L. Knight Building, a soaring glass and steel structure by the celebrated Viennese architectural firm Coop Himmelb(l)au. The brick building opened in 1899 as Akron's main post office. Designed under the direction of James Knox Taylor, supervising architect for the Treasury Department, it has walls of deep red brick laid in the Flemish Bond pattern and adorned with limestone trim. Pairs of carved eagle medallions and bronze lanterns decorate its Market Street façade and a mosaic depicting a Pony Express rider is imbedded in its lobby floor. An outstanding example of the Italian Renaissance revival style, the building is listed on the National Register of Historic Places. The Akron Art Museum moved into the building in 1981 after a major renovation by Cleveland's Dalton, van Dijk, Johnson & Partners. The firm's design won architectural awards for adaptive reuse. The 2007 design by Coop Himmelb(l)au integrated approximately 21,000 square feet of the 1899 building with a new 63,300 square foot building. Coop Himmelb(l)au [www.ccop-himmelblau.at] founded in 1968 by principals Wolf D. Prix and Helmut Swiczinsky, is renowned for its leadership in contemporary architectural theory and practice and its thought-provoking approach to the reinvention of existing buildings. The Akron Art Museum is the firm's first public project in the United States and, while still under construction, received a 2005 American Architecture Award from the Chicago Athenaeum. The museum's design employs innovative engineering to generate a structure that is highly functional and energy efficient but also visually spectacular, providing a new landmark for the city. Prix asserts, "The dream of the architect is to get rid of gravity." Throughout the building are cantilevered, suspended and floating forms, as evidenced in its three main architectural elements. The "Crystal," a three-story glass and steel lobby, is a focal point connecting the museum's spaces while also serving the city as an indoor piazza. The "Gallery Box," a flexible exhibition space clad in aluminum panels, appears to float due to its 52-foot cantilever. The "Roof Cloud" is a 327-foot long cantilevered steel armature extending over and embracing the old and new buildings and part of the street.